This is an absolute must piece to compliment any Goddesses bathroom essentials. 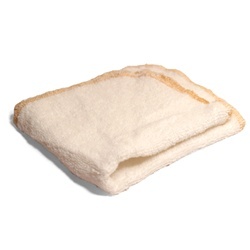 The feel of the Aum Face Cloth is so absorbent and soft you will be amazed miraculously transformed ! Features: all absorbing fabric surged in our trademark Aum Goddess gold thread, luxurious beyond belief. Size is 11 " x 12 "
Fabric: 55 % hemp / 45 % organic cotton also known as double sided terry cloth ... who knew hemp was so soft.